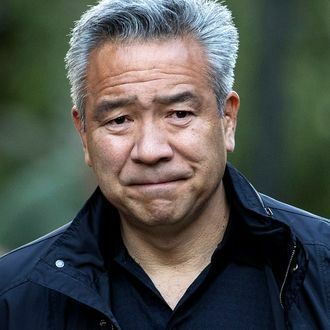 Kevin Tsujihara is stepping down as chairman and CEO of Warner Bros. Entertainment. “It has become clear that my continued leadership could be a distraction and an obstacle to the company’s continued success,” Tsujihara said in a memo sent on Monday. “The hard work of everyone within our organization is truly admirable, and I won’t let media attention on my past detract from all the great work the team is doing.” Tsujihara’s exit comes amid accusations in The Hollywood Reporter that he pushed for the actress Charlotte Kirk to get auditions for Warner Bros. movies as the two had a sexual relationship. Kirk ultimately appeared in Ocean’s 8 and How to Be Single. An outside law firm is still investigating allegations against Tsujihara within the studio. “It is in the best interest of WarnerMedia, Warner Bros., our employees and our partners for Kevin to step down as Chairman and CEO of Warner Bros.,” WarnerMedia CEO John Stankey said in a memo also sent on Monday. Tsujihara has led Warner Bros. since 2013, and has worked for the studio since 1994. The studio did not name a replacement.